Alcoa Inc. spent $590,000 in the second quarter to lobby Congress on issues ranging from cap-and-trade to defense appropriations, according to a recent disclosure report. The total compared with $680,000 that the aluminum manufacturing giant spent lobbying in the year-ago quarter and $1.26 million spent in the first quarter. From April through June, Alcoa lobbied on cap-and-trade issues such as allocation credit for early action and international trade implications. Other issues included defense appropriations related to naval and air programs and hydroelectric generating facilities. The manufacturer also addressed power availability from the Tennessee Valley Authority and power authority from the Bonneville Power Administration. No legislation was discussed on these topics. 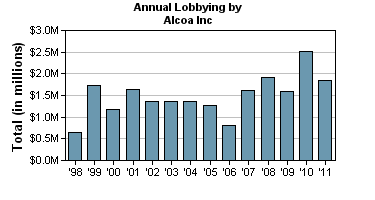 Alcoa lobbied both the House of Representatives and the Senate during the quarter, according to a July 19 report filed with the House clerk's office.